Authors, Business owners, Non-profits: Learn how to build a massive online audience to dramatically expand your message and grow your revenue. 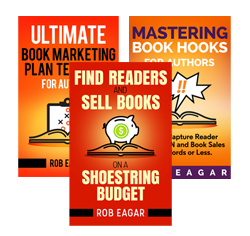 Enjoy four concise teaching videos (15-20 minutes each) from Rob Eagar as he explains step-by-step how to attract thousands of people using the best online methods available. In addition, six marketing exercises are included to help you make immediate progress. Part 1 – Learn how to position yourself as an object of interest so people follow you. Part 2 – Discover how to use free content to entice people to join your audience. Part 3 – Tips and techniques to create tools that increase your subscriber rates. Part 4 – Best practices to connect with your audience and boost product sales. Step 1: To get started, click on the Part 1 teaching video in the window above and select “Buy Now.” After you’ve paid using PayPal or a credit card, you’ll get automatic access to the teaching videos. Plus, you’ll receive an Access Code via email to use when you return to watch the rest of the videos. Step 2: Watch each teaching video on your computer, tablet, or smartphone. Step 3: After viewing each video, download the exercises to help you immediately start making progress. After you’ve finished this 4-part course along with the exercises, you’ll be well on your way to building a MASSIVE online audience. Imagine thousands of people responding to any message that you send out. Imagine launching new products and services to thousands of people who are ready to buy. Purchase now and start building your massive online audience today!